A retaining wall behind Bangor City Hall. City officials plan to renovate the deteriorating wall over the summer. The city of Bangor's Engineering Department has issued a map showing temporary traffic and parking changes being made in anticipation of Monday's start of a $1 million project aimed at repairing a century-old retaining wall on Park Street, directly behind Bangor City Hall. Beginning on Monday, Park Street will be reduced to one travel lane to accommodate a $1 million retaining wall repair project expected to last around 12 weeks. 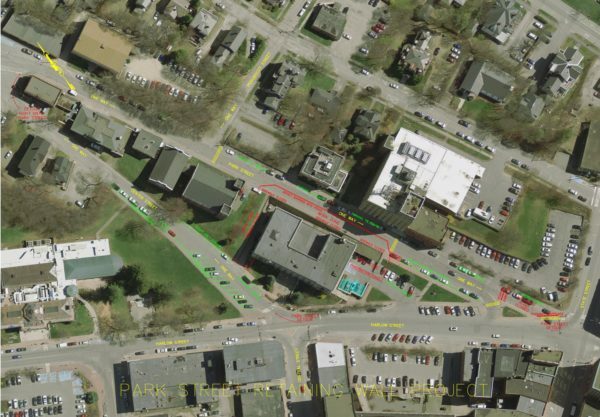 Vehicular traffic will be allowed to travel in the direction of downtown during the project, but access to Park Street will be from Center Street only and not from Exchange or State streets, the city of Bangor’s Engineering Department said Thursday in a news release. The partial closure of Park Street is needed to allow for repairs to the 405-foot long Park Street hill retaining wall located directly behind City Hall. 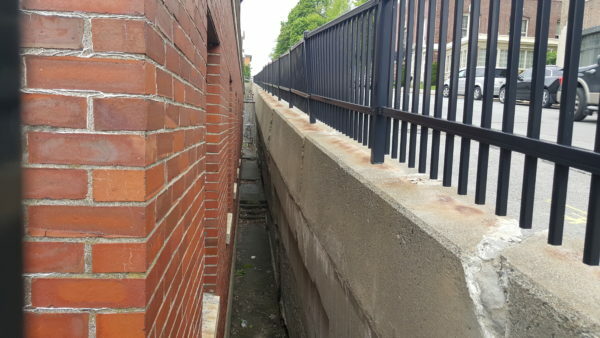 The retaining wall was built about a century ago and hasn’t been repaired since 1978, according to a 2015 evaluation of the wall done by the Bangor-based consultants FGS/CMT Inc., City Engineer John Theriault said in June. While Theriault said at the time that the wall was not on the verge of collapse, it is showing breaking, cracking and tilting as well as extensive weather wear. Without repair, he said, the wall could become unstable and give way, putting part of the street at risk of collapse. A team comprising Sargent Corporation, CES and Geostabilization International will be performing the repairs, which are likely to take about 12 weeks. Motorists are urged to drive safely within the work zone and observe all signage. Businesses along Park Street will remain open throughout the project and on street parking will continue to be available along Park Street, city officials said. Additionally, access to Bangor City Hall by the handicapped entrance will remain available throughout the project. Handicapped and mobility challenged parking will be available in the upper lot immediately adjacent to city hall. City staff will provide updates throughout the project through the city’s website, Facebook page and Twitter accounts and government access cable television channel. The public can receive traffic alerts by subscribing to the City’s email notification services at www.bangormaine.gov/subscribe. Any questions or concerns regarding this project should be directed to City Engineer John Theriault at 992-4249 or via email at john.theriault@bangormaine.gov.